My method of managing scraps is that when a bin gets full it's time to design a quilt around what's in the bin. 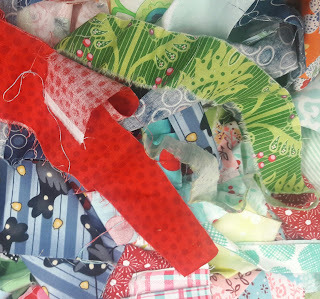 I organize my scraps in bins by color, for scraps between the size of a fat quarter and charm square. Those smaller than a charm square go in a bits bin. I also have a bins with 1 1/2" strips, 2 1/2" strips and random widths. Well, my random widths bin can barely be contained by it's lid. 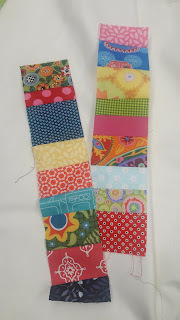 So it's time to design a quilt using these strips. I by sewing those strips into stratas and then cutting them into little sets of coins. I have a couple of planes for these coin sets. But so far this is all the progress I have with this new project. I'd love to see what you are moving forward. Are you tackling an unruly scrap bin? Is a new brain child forming in your head? Or are you making progress on an existing project. Grab my botton, fixed thanks to Sarah and link up and share. A great system to use to keep those scraps from taking over. Can't wait to see the result of this bin. Ahhhh....so pretty. Looks like they would make great bookmarks - but that would be a ton of bookmarks! I'm sure your project will be beautiful! I'm always interested to see what people do with their scraps. I keep mine by colors but have never made a real plan for them. Hum, I mostly hope that my bins and such don't fill up. They do! I was happy to move a few of the strips into string blocks last week. Sometimes what I need in terms of scraps just aren't in my bins. Maybe it's time for a coin quilt like you're working on. I'm tackling too many scrap bins at the moment! Looks like you have a great plan, I think I should follow your lead! I sat my strips bag (yes it's that big) next to my cutting table awhile ago with the intention of picking out a string project that I can use as a leader/ender project. I just snagged two phone books recently for foundations so it's time to get it in gear! You have the right idea: if you don't put them to work, they ain't going anywhere! Wow. You have a plethora of scrap bins. I only have one but use your same philosophy: when the bag is stuffed full, it's time to use them up. Love your Coin strata and can't wait to see the finish! I know whatever you decide it will be fabulous.